As if the growing number of smoking bans in restaurants, airplanes and other public places isn't sending a strong enough message, researchers now have the first biological data confirming the health hazards of secondhand smoke. Scientists led by Dr. Ronald Crystal at Weill Cornell Medical College documented changes in genetic activity among nonsmokers triggered by exposure to secondhand cigarette smoke. Public-health bans on smoking have been fueled by strong population-based data that links exposure to secondhand cigarette smoke and a higher incidence of lung diseases such as emphysema and even lung cancer, but do not establish a biological cause for the correlation. Now, for the first time, researchers can point to one possible cause: the passive recipient's genes are actually being affected. Crystal's team devised a study in which 121 volunteers  some of whom smoked and some of whom had never smoked  agreed to have samples of their airway cells studied for genetic activity. The subjects also provided urine so the researchers could measure the amount of nicotine and its metabolites, like cotinine, for an objective record of their exposure to cigarette smoke. Airway cells that line the bronchus, from the trachea all the way to the tiny alveoli deep in the lungs, are the first cells that confront cigarette smoke, whether it is inhaled directly from a cigarette or secondhand from the environment. Crystal's group hypothesized that any deterioration in lung function associated with cancer or chronic obstructive pulmonary disease, including emphysema and bronchitis, in which the lungs lose their ability to take in air, would begin with these cells. And indeed, that's what he and his team found. The researchers removed airway cells from the volunteers using a bronchoscope and tested all 25,000 identified human genes in them to determine which ones were active  either turned on or off  in response to cigarettes. 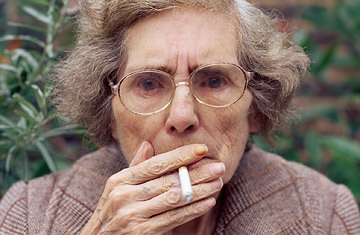 They narrowed the search to 372 genes that were active among the smokers but not in the cells of the nonsmokers. Based on the level of nicotine in the urine, the scientists also divided the volunteers into three groups: smokers, who showed the highest level of the tobacco metabolites; nonsmokers, who showed none of these compounds and a low-exposure group who fell in between. Comparing the 372 genes among these three groups, they found that the low-exposure group shared 34% of the same active genes with nonsmokers and 11% of the same gene activity with smokers. The low-exposure group included both nonsmokers who have never lit up as well as those who admitted to smoking only occasionally. The results suggest that the genetic changes among the low-exposure volunteers, some of whose exposure is exclusively secondhand, mimicked those of smokers and represent the first molecular steps toward later lung disease. The study did not follow the subjects long enough to document what effect the genetic changes may actually have on the lung tissue, but Crystal says those studies are forthcoming. "What is interesting to me is how sensitive the lung cells are to any cigarette smoke," he says. "It doesn't matter if you are walking into a cocktail party where other people are smoking or if you smoke one cigarette a week. No matter what level of exposure you have, your lung cells know it and they are responding. It's sort of like canaries in the coal mine  they are crying out and saying, 'I'm changing here, I'm changing the genes that I turn on and off in response to this environmental stress.'" It's not clear how permanent these genetic changes are, but previous data suggests that, at least in smokers, some of the alterations may be irreversible. Smokers experience a decline in lung function that is accelerated compared with nonsmokers, and even if they kick the habit, they can never achieve the same level of function as those who never lit up. If the genetic results are confirmed, says Crystal, they may help doctors to identify those whose genetic makeup put them at higher risk of developing lung disease when exposed to cigarettes, and potentially steer them toward drugs that can help them suppress the dangerous effects of nicotine on their cells. In the meantime, the latest findings should reinforce public-health messages about the dangers of cigarette smoke, even if it is secondhand, says Dr. Norman Edelman, chief medical officer of the American Lung Association. "When you look at the biology, there is no safe level of exposure to tobacco smoke," he says. "This [study] adds an important piece of evidence that inhaling secondhand smoke is deleterious and does things to the airway that are not good." See a video on the end of cigarettes at French bars and restaurants. Buy reprints of TIME's health and medicine covers.